On a chill, gray Monday morning, on February 21, 1972, I stood on the steps of the old Hongqiao Airport terminal. I had arrived in Shanghai twenty minutes in advance of President Nixon. I was on the backup plane, which arrived first, so I actually saw the arrival of Air Force One in Shanghai. I had studied Chinese in Taiwan, but this was, of course, my first encounter with the Chinese mainland. My eye was drawn to a billboard that defiantly proclaimed, much as those at the airport in Taipei did at the time (with seven of the same eight ideograms), "we have friends all over the world." As Air Force One pulled up and cut its engines to refuel and take on a Chinese navigator before flying onward to Beijing, I heard a bird sing. Judging from the presence of birds but the absence of aircraft at Hongqiao, I deduced, all those foreign friends of China couldn't be conducting their comradely visits by air. As our president and his wife deplaned for an off-camera cup of tea, I was reminded that I had written some advice for Mrs. Nixon, which was not to wear red, a color associated in China with weddings or prostitutes. Of course, she got off in a brilliant red overcoat. So much for that advice. But it was photogenic, which was obviously the main concern. I struck up a conversation with a Chinese foreign ministry official, the first I had ever met. I was, it turned out, also the first American official with whom he had ever spoken. That day culminated in President Nixon's meeting with Chairman Mao and dinner with much of the Chinese Communist Party Central Committee in Beijing. It was a day of mutual discovery for many Chinese and Americans. Not just for me and others who took part in some or all of its events, but for all whose stereotypes were blown away by the images on television. We went from the airport arrival ceremony to the Diaoyutai guesthouse. There were three interpreters: myself, as the senior interpreter; Cal Maehlert, who had excellent Chinese, who had been pulled out of Saigon for this purpose; and Paul Kovenach, who had been recruited by somebody or other for the purpose. We were an odd group, because Cal Maehlert was rabidly pro-Guomindang and in fact a great personal friend of Jiang Jingguo [Chiang Kai-shek’s son and future President of the Republic of China]. And right after the trip, he went off on a hunting trip in Taiwan with Jiang Jingguo and probably told him everything. He also lost his entire, I believe, at least he couldn't account for, his copy of all the briefing papers. Paul Kovenach was as close as you could get then to a Taiwan-independence advocate. Paul and I rode in together from the airport. I still didn't know what I was to do. There was a brief preliminary meeting with the Chinese at the guesthouse, where essentially they did the interpreting. It wasn't until later that I was suddenly called over to the president's villa in the Diaoyutai guesthouse, with the assurance I would be told what I was to do. Cal and Paul came along, and we were all put into a side room. The president came out, and I noticed he was wearing pancake makeup, and there was a large glob of Max Factor hanging from a hair in the middle of the groove at the end of his nose. But all he did was shake hands, say he was pleased to meet us, and not tell us anything about what we were to do. So we went back to our villa, on hold. There was to have been a banquet early in the evening, but Nixon went off unexpectedly to see Mao, excluding Secretary of State William (“Bill”) Rogers and everyone from the State Department. Suddenly, a little after eight o'clock in the evening, the banquet having been moved down to about nine-thirty, I was called over to the president's villa again. There was a bunch of people milling around, a couple of Chinese interpreters, Ji Chaozhu and Tang Wensheng ("Nancy" Tang), and a number of other protocol people, including some I've since gotten to know very well on the Chinese side. Dwight Chapin, the appointments secretary for the president, came out and said, "The president would like you to interpret the banquet toast tonight." And I said, "Fine. Could I have the text, please, so that I can work it over?" He said, "Well, I don't know. There may not be a text." I said, "Well, I know there's a text. And Chinese is not French or Spanish. One has to consider carefully how this is done, if it's to be done well. I'm sure there's a text, and I'd appreciate your getting it for me." He went into the president's office, and came out and said, "There is no text, and the president would like you to interpret." I said, "Well, I happen to know that there is a text. And really I must insist on having that text. I have something approaching a photographic memory; I just need to read it once." At any rate, he went back in again, and he came out, and he said, "There is no text, and the president orders you to interpret." And I said, "Well, it might interest you to know that I did the first draft of the toast tonight, and while I don't know what was done to it, in detail, at the NSC and by the speech writers, I do know that some of Chairman Mao's poetry was inserted into it. And if you think I'm going to get up in front of the entire Chinese politburo and ad lib Chairman Mao's poetry back into Chinese, you're nuts. So, either..."
He said, "All right." And he took the text out of his pocket and gave it to the Chinese. And so they had it. Later, Ji Chaozhu, who did the interpreting, consulted with me on a number of points before he did it. Indeed it did contain some of Chairman Mao's poetry, and it would have been catastrophic for me to try to interpret it back into Chinese. So my first act as interpreter of Chinese (this was my debut as interpreter; I had never interpreted except in a classroom) was to refuse to interpret. As we sat through the banquet, I was at the head table with Nixon and Zhou Enlai and Kissinger and Ji Pengfei and Li Xiannian, later president of China, and, I think, Qiao Guanhua, who was, in fact, the brains in the Foreign Ministry, and Bill Rogers, of course, and Mrs. Nixon. Interpreting for them, I could see the president glaring at me across the table, with his jowls wobbling and a grim expression on his face, obviously mighty annoyed that I had pulled this stunt. I have thought a lot about why he might have wished to conceal the fact that there was a text. The fact is that he had a habit of memorizing speeches, and he liked to appear to be ad-libbing them, giving them extemporaneously, which is what Dwight Chapin had told me he planned to do. And I think he was afraid I would stand up there with the text, which I wouldn't have done, of course. In any event, he also had a predilection for using the other side's interpreters, because they wouldn't leak to the U.S. press and Congress. So all these things came together. Two days later, after some other things had happened, he apologized to me. He called me over and said, "I'm sorry. I made a mistake. That was wrong. I shouldn't have done that." And there were tears in his eyes. Then he did some other things that were by way of making amends. It was odd. I did not smoke at that time. I had given it up nine years previously, when I was in law school. But right after I had refused to interpret the president’s toast, I remember, Li Xiannian, then sort of the chief economic planner of China, later the president, offering me a cigarette. I took it, and I smoked for the next thirty years. I was terribly nervous. I was both proud of what I'd done and vindicated by the nature of the toast, and also numb with shock at what I'd done, figuring that my career was over and that that was it. The president and Zhou Enlai hardly talked at all. Nancy Tang was covering them, and I was covering the others. As the evening went on, since there was no discussion going on, I started talking with Qiao Guanhua and several of the Chinese, in Chinese. We were just chatting about various things; I asked some questions about the schedule and this kind of thing. It wasn't a very substantive conversation. As it turned out, I did all of the interpreting for the meetings between the foreign ministers, which very much fit the mode. I think Ambassador Averell Harriman remarked once that the diatribe is left to the foreign ministers, while the chiefs of state have a pleasant conversation. We had several such lengthy sessions with the acting foreign minister while the president communed with Zhou Enlai. Of course, I was fatigued out of my mind. It was such an intense experience that, for probably a year after, I could have replayed all of those conversations verbatim. I could also read the Chinese briefing book upside down across the table, since I had taught myself to read Chinese upside down, thinking it might be useful someday. And that helped a bit. Those discussions were essentially on the level of detail and exchanging complaints and interpretations of history and the like, some of which I think astonished Bill Rogers, as it turned out that he wasn't terribly familiar with the details of history, such as the precise origins and course of the Korean War and various U.S. statements on foreign policy matters. The Chinese pulled out a whole series of news articles, to try to show that the United States was hegemonic. And we got into great arguments, their interpreter and I, over the translation of a few key concepts, like deterrence, which they had translated as intimidation, a rendering to which I took exception. Of course, they had their own highly prejudicial vocabulary. They had not been subjected to the influence of positivism. They saw nothing wrong with making statements that were value laden, and they did so. In fact, they used language prescriptively, rather than descriptively, much unlike us. So it was a lively, but rather inconsequential, venting of views. My impression about Mao Zedong was very little. He was so heavily screened from his own people that he was quite a mysterious figure. Zhou Enlai was always the urbane, loyal implementer of Mao's policies, implementer in the best sense: he would take broad concepts and translate them into something that could work. I had, of course, read much about him. I remembered a remark that former UN Secretary General Dag Hammarskjold had made, to the effect that, when he first met Zhou Enlai, as he did, I believe, during the effort to compose a truce in Korea, for the first time in his life he felt uncivilized in the presence of a civilized man. There was this enormous grace and charm about him. Indeed, at one of the dinner conversations on the second night, Zhou Enlai engaged me in conversation across the table, asking about my background, where I had learned Chinese, what I thought about this trip, and so forth, with the Chinese interpreter interpreting our conversation for the president. I can't remember the exact day, but I snuck out (snuck out is the wrong word, because one couldn't sneak anywhere in China) but, with Chinese connivance, I got out to the New China Bookstore on Wangfujing Street in Beijing. I was looking for a copy of The Twenty-four Dynastic Histories. Each dynasty in China writes the history of its predecessor. And there is a tradition of considerable objectivity and really great professionalism in the writing of these things. They go back well over two thousand years, and they are the most complete record of any human civilization that exists. They contain information on everything from the amount of rainfall in a given year to the court dress to events in foreign relations to domestic political and economic policy changes to the life of the court and so forth. I wanted to see if I could buy these, and I had brought a pile of money with me. I had read, actually, in an intelligence report, that they had been published. The book store told me that scholars were still busily preparing these. I was told that they were not published yet. Zhou Enlai, obviously well briefed by his staff, on our last day in Beijing, at lunch, spoke to me across the table and said, "I understand you're interested in the Twenty-Five Histories. I didn't know that they had written the history of the Republic of China, the twenty-fifth dynasty on the Mainland. We talked a bit about those, and he explained to me, for the benefit of Nixon, what these things were. And he said the work in publication had not yet been completed, but that, as a response to my interest in them, he was going to give two sets of an original edition of these things to the United States, one to the White House and one to the State Department. And indeed, in the State Department Library, there is the boxed set of the “Bo Na Ben,” which he presented to the Department through me. And he also gave me, separately, three books of literary criticism on a favorite poet and writer, by someone that Mao was very fond of, an intellectual that Mao admired, who was the father of one of the Chinese interpreters, someone who was then having an affair with the foreign minister and who later married him. In any event, that conversation then led, in Hangzhou, to Nixon calling me over, as I mentioned, to apologize. And he said several things. I did some interpreting between him and Zhou. Then he said something to Zhou Enlai that I found grossly embarrassing. He said, "Mr. Premier, I want you to take note of this young man." I interpreted that. Then he said, "Because very likely he will be the first American ambassador to China." I was 27 or 28, and I thought to myself, "My God, he's either saying that they're going to have to wait thirty years for an embassy, until this fellow grows up, or he's saying they're going to send the least consequential, youngest ambassador ever to China." I was just terribly embarrassed. I didn't interpret it; Nancy Tang did. Zhou Enlai muttered something like, "That'll be the day," and that was the end of that. But Zhou then asked me to stay on, and we talked some more. He asked more about our diplomatic service and various things. After that, I was feeling fairly good, having been apologized to by the president and praised by Zhou Enlai. There were two military officers from the military region in Eastern China where we were. This was the first visit by Zhou Enlai to the region since the Lin Biao incident, and the military were all on tiptoes. Anyway, I started talking to these two guys about the Korean War, in which both of them had participated. We got to drinking, and, as you know, in China, you never drink without toasting someone. Well, I sort of concentrated on these two fellows, and pretty soon they were very happy and glowing with pleasure. They got up and went around the table, and in a terrible faux pas, said to Zhou En-lai, and I could hear this, "Since that unfortunate incident, we've not seen you down here. We want you to know that we're personally loyal to you, Mr. Premier." There was great embarrassment on the Chinese side at this maneuver, which they attributed, probably in part correctly, to my having gotten these two guys drunk. So Qiao Guanhua, who was a famous drinker, turned on me and started getting me drunk. We had, I think, twenty-three glasses of Maotai. By the end of the evening, I was feeling no pain whatsoever. But, fortunately, Maotai passes through the system quickly, so it did no permanent damage. In Hangzhou, Kissinger and company were sequestered, with Nixon closely looking on from a distance, dealing with the final elements of the Shanghai Communique. The State Department was excluded from that. Assistant Secretary of State for East Asia Marshall Green played a crucial role there in rejecting and insisting on a revision of some of the language on Taiwan, which would have given away a point that we didn't need to give away. Both Taipei and Beijing, the two regimes which have been in a civil war since the 1920s, regarded Taiwan as part of China and believed there was only one China. At that time, they simply disputed which one of them was entitled to represent China as the legitimate government of China. So the United States, by the artful language of the Shanghai Communique, took note of this agreement between them and said we didn't challenge it. That was the basis for the framework by which we were able to manage, and have been, to this day, able to manage, relationships between Taipei, Beijing, and Washington. As I recall, Kissinger began to accede to language that went beyond stating that we didn't challenge this view, and appeared to endorse it more directly. And it was that to which Marshall Green objected and on which he got Bill Rogers to weigh in. At any rate, he played a very important role at that moment. The Shanghai Communique, so called, which was issued February 28, 1972, on our departure from Shanghai, which was our last stop, was actually agreed in Hangzhou. I didn't see the text until we were in Shanghai, when I was asked to review the Chinese text, which I did with Ji Chaozhu. As is always the case between two languages there is no complete coincidence of meaning, there is an overlap, and there are several possible renditions of words, some of them key words. I found, to my very pleasant surprise that the Chinese translation had bent over backwards faithfully to render the reservations of the United States and really required no polishing at all. I did make a couple of suggestions, some of which were accepted and some of which weren't. But it was a very artful piece of very professional translation that they did. I mention my review of the communique because it's become an article of faith that no one did review the text. I suspect that Kissinger isn't aware that it was actually reviewed by an American interpreter. But it was, and after that, it was put in final form and released. The original language on Taiwan, as well as the language that I had crafted, establishing various mechanisms for interaction economic, cultural, and continuing diplomatic dialogue was essentially accepted in the text. It was an unusual communique, in the sense that it began with a lengthy recitation of differences, and then, in effect, said that notwithstanding the foregoing, we have a common interest in opposing the hegemonic ambitions of other powers. Neither of us seeks hegemony, we do not wish anyone else to have it, and therefore we will engage in this relationship. The Cultural Revolution was still in progress in 1972 and Beijing was a cultural desert. One of the first things that I always do when I go to a new place is to look at what people are reading, or, indeed, whether they're reading anything at all. And here was a city, a large city, probably at that point six million or so people, in which nobody was reading anything, and in which, in the bookstores, aside from the dogma, there was virtually nothing for sale. I found that the former edition of the Little Red Book of Mao's quotations, which was the Bible of the Cultural Revolution and had been blessed with a foreword by Lin Biao, had been removed from circulation. I managed to get a copy in Shanghai by browbeating a shopkeeper to take one out from under the table. It may have been the last such copy left in China. Everybody was wearing Mao badges. Very much in my mind was the image of this cultural desert, like deserts elsewhere, occasionally bursting suddenly into bloom, with vast demonstrations in Tiananmen. But Beijing was under very tight security control. 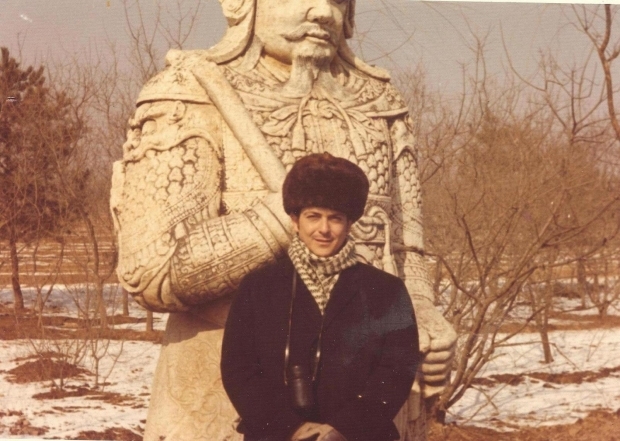 There were veterans of the Korean War in China, who had no cause to love Americans; there was the residue of the Lin Biao incident, and the place was buttoned down tight. In Hangzhou, I went out on the street to go shopping and had one of the eeriest experiences of my life. When I went into a department store, there were thousands of Chinese in there, none of them speaking. You could only hear the swish of clothing contacting and cotton-soled shoes rubbing on the terrazzo. Of course, we were shadowed by security people, several layers of them. The basic theory of security in China, as I knew, is very similar to ours; that is, there should be three layers of security. And I was able to spot the three layers, to the point where, in Hangzhou, when I wanted to buy some records of the Chinese Revolutionary operas, which I had read in the libretto but had never heard, I didn't have enough renminbi, Chinese currency, so I went to one of the fellows who was in the inner perimeter, a plainclothes fellow shadowing me, and I said, "I think you're with me. I don't know if you have any money, but I need to borrow some money. I'll pay you back when we get back to the guesthouse." He was shocked, but he gave me the money, and I bought the records, as well as some other things, some chopsticks and things like that. On the way back, walking on the street, I saw the tension revealed when a couple of these security people, who now had come out of their effort to conceal themselves and were preceding me on the sidewalk, literally knocked people off the sidewalk to make way. They were terribly nervous, and probably for good reason. And I'm sure that their paranoia was increased by our Secret Service, which, of course, is pathological on the subject of security. In any event, it was not the period of the Cultural Revolution when starvation was at its peak; rather, that was after the Great Leap Forward. And time marches on. I was astonished on the Great Wall, when I dropped back and started talking to a couple of the local Chinese guides. Since the president was interested in being photographed and didn't want me in the photo, I turned the job of interpreting over to the Chinese and went back to talk to some of the ordinary little girls who were serving as guides, and I asked one of them, "What did you do during the Cultural Revolution?" And she said, "Well, I was too young." I meant at the height of it, which was only a few years before. But, of course, she was right, and it suddenly dawned on me that time does march on. This event, which was one of the great events in history, had come while she was still a child. I also remember asking her whether she was aware that men had landed on the moon. And she said she didn't know that. So we talked a bit about that. But later I discovered that in fact the Chinese were terribly well informed, in many ways, about the outside world, that there was something called Reference News, which any Chinese could subscribe to, not then but later, which rather faithfully selected and reprinted articles from the Die Zeit and the New York Times and the Washington Post and the Times of London and so forth. So, someone a bit older than she certainly would have been aware of the whole Apollo series. She was not. When I left Shanghai, I was still on the backup plane. The mood was euphoric. We had accomplished our purpose, which was a strategic one. We had not given away very much on Taiwan. We had held our ground on other international issues. We had established the framework for a relationship. The one item that was unclear was the precise mechanism for future diplomatic contact. We had agreed on the channel, through the embassies in Paris. I didn't know it at the time, but Paris had in fact been a point of contact, through General, later Ambassador Vernon Walters, with the Chinese, primarily on the Vietnam War. And Kissinger had found it convenient during his contacts with the Vietnamese there to also maintain contact with the Chinese. So there was a certain logic to that. In the past four decades, China has changed so much and become so much part of the world and Sino-American relations have become so tangled in multiple intimacies that the international solitude China then enjoyed can no longer be imagined. There is no birdsong now at the Hongqiao or Pudong airports. Instead, there are hundreds of jet aircraft arriving and departing for every corner of China and the globe. China has become the world's third-largest destination for foreign visitors. And the human ties between almost every sector of our two formerly estranged societies are now rich, ubiquitous, intricate, and warm. Yet China and the United States began our contemporary relationship not with affection but with cold strategic calculation. The American intention was to alter the world's strategic geometry, not to change China by opening it to outside influence. Ours was a marriage between hostile parties arranged by geopolitics. It took place despite bitter disagreement on many matters and highly negative images of each other. Today, when people think of the Shanghai Communiqué, they remember the way in which it finessed differences over the question of Taiwan's relationship to the rest of China and pointed to the need for Chinese on the two sides of the Strait to craft their own peaceful resolution of it. That language was, of course, a major achievement for both sides. But, in diplomatic history, the most innovative element of the Shanghai Communiqué was not the creative ambiguity of its language about Taiwan. It was the unprecedented candor with which the text recorded sharp differences between the United States and China on many regional and global issues. And, in terms of the broad national security and foreign policies of our two countries, the essential paragraph was not that about Taiwan. It was our mutual acknowledgment that, while "there are essential differences between China and the United States in their social systems and foreign policies," we could and should set aside these differences in the interest of sustaining a mutually advantageous international security order and pursuing common purposes in accordance with international law and comity. I do not paraphrase by much. Such realism and mutual respect, tempered by deference to the rules of international conduct, was a wise basis on which to open a relationship between two great nations with the capacity greatly to help or hurt each other. It also delivered the strategic results both sides intended. The essence of this approach was qiutongcongyi (seek common ground while reserving differences)—preventing differences on relatively minor matters from obstructing the search for agreement on others of greater importance. Today, despite the political and economic bonds between Chinese and Americans, the two countries appear to be drifting back into military antagonism. We would do well to rediscover the strategic vision and willingness to adjust policies to advance our national interests that were so much in evidence in February of 1972.